Control...a word that I used to be proud to use. I remember in college saying, "I don't like working in small groups because I'd rather be able to 'control' the outcome of the project." I struggled with going with the flow like my husband so easily did, because my need to control was thrown off kilter. I eventually learned my control was rooted in fear. Fear had driven me to want to control everything, and perfectionism was something I aimed to attain. But perfect love casts out fear and once you realize that Jesus's love and his beyond-anything-you-imagined kind of freedom that he provides, we can let the reins of control down and live a life of faith over control. Melanie Martineau with Martineau Rasp Designs learned this same freedom in her journey of hearing God's voice in her life. This is a savvy business woman who now takes risks based on the promptings of the Holy Spirit and her and her husband haven't looked back since! When I was asked to share any experience or testimony I’ve had with God for the Cooped Up Cowboy’s Wife, I was extremely honored and in shock at the same time. I initially thought, “Wow, how amazing is this opportunity to share God and his love for us?” Then I thought, “Oh gosh, what could I possibly share or contribute? I’m not prepared for this in any way.” When I realized I was starting to overthink this opportunity, I stopped, took about five minutes to pause, and simply reflect on how God has blessed my life and my family. I was amazed at how many experiences I’ve had with God, especially just in the last four years. However, one experience in particular automatically made me so happy and full of love, full of God’s love. I’ll be stepping back and forth in time to give you some background of this particular life changing experience. I was a stay-at-home mom raising our first two daughters who were one and two years old. My husband was a full time horseshoer and training horses on the side. We had a hobby of making custom Rasp jewelry as gifts for family, close friends, and horseshoeing clients. It was just a hobby during this time. 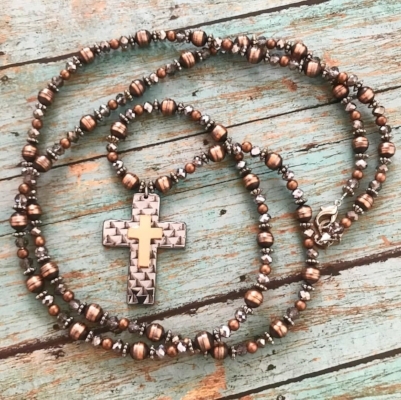 We noticed our hobby of making Rasp jewelry was rapidly growing as our family and friends were getting the word out about it. We had zero plans to transform our hobby into a business. A few of the beautiful pieces that Malanie and Bryan transform out of rasps. One afternoon when Bryan was working in the shop, I went to check on him and see if he needed anything. As I walked through the door, a voice came over me and told me, “Drive to Vegas." My train of thought and why I went to the garage was completely taken back when I heard the voice and these words. I had never heard this voice before. I immediately thought, “Why do I need to drive to Vegas? That is a completely random and ridiculous thing to do. What is going on and why do I need to “Drive to Vegas?!" I ignored it for the moment, checked on Bryan and went back in the house. Why was a voice telling me “Drive to Vegas” and where was this coming from? I tried to ignore it the rest of the day, but it kept getting stronger. I didn’t tell Bryan that day about this voice and the words being delivered as I was trying to figure it all out myself. The next day, we happened to talk about if our hobby could grow into a business and if we even wanted it to. During this discussion, Bryan mentioned being a vendor during the National Finals Rodeo (NFR) and World Series of Team Roping Championships (WSTRC) at South Point in Vegas. Then it hit me like a bolt of lighting…I’ve been hearing God’s voice. He’s telling me to “Drive to Vegas." Was this in regards to being a vendor with our rasp jewelry during NFR and WSTRC? This seemed absolutely crazy to me, as we were nowhere near prepared to be a vendor, especially at NFR and WSTRC! I couldn’t hold it in anymore and finally told Bryan, “I think God is telling me to drive to Vegas.” He looked at me in shock and didn’t really understand what I was saying. I explained to him more in depth what I was experiencing and how I finally realized its God’s voice I was hearing. We talked all night about being a vendor and researched venues, options, dates, costs, everything. Any question one could think of, we thought of that night and discussed till early hours of the morning. We spent the next month researching the venues and landed on South Point. If we were going to be a vendor during the NFR and WSTRC, we wanted to be in the best location, so South Point was our goal. I spent a month calling and emailing South Point and couldn’t get through. I was about ready to call this whole idea quits when Bryan reminded me about God telling me to “Drive to Vegas." Even though it seemed all odds were against us with becoming a vendor at South Point, we made the decision for me to make the four hour drive to Vegas the next day and meet with someone from the South Point Arena team. I was so nervous the next morning driving to Vegas, especially on such a whim, with no plan in place. I had never done anything like this before and was completely out of my element. Being the planner and perfectionist I am, it took a lot of self-talk and prayer time to calm me down during the drive. After missing one of the main turn offs to Vegas, driving over an hour in the wrong direction, I finally arrived at South Point. I remember thinking, should I sit in the car and take an hour to plan out what I’m going to say, ask or even present to whomever I meeting with? I had no meeting set up. I had no idea who I would even talk to or try to talk to. I didn’t know if anyone would even be available. I knew what I had to do; stop trying to plan everything out and simply lift it up to God, walk in the arena office, and figure it out from there…much easier said than done right? I walked in the arena office and no one was in the office, not one single person. Well, what was I going to do now? Wait outside the door till someone shows up? I was too anxious to stand and wait, so I went to the arena and watched the cutting event for half an hour. I walked back to the office and no one was there, again. Back I walked to the arena and watched the cutting again for another half hour. For the third time, I walked in the office and no one was there. My frustration at this point was at an all time high. I let my mind get the best of me and I walked out of South Point. I got in the car and started driving cause I was so frustrated and confused. Then I started driving in the direction of home. I called Bryan and told him I was coming home and no one was in the office. He couldn’t believe I had driven all that way and was already coming home. Then he reminded me of hearing God’s voice and to not give up even though I didn’t have a plan in place. He advised me to get out of my head and simply drive back and try again. As crazy and confused as I felt, I drove back to South Point. For the forth time now, I walked into the arena office and not a single person was there, or so I thought. I didn’t hear anyone and thought maybe they’re in a meeting in a back office. I decided to walk towards the back offices and ask if anyone was here. Finally I heard a voice, a person’s voice! Turned out it was the exact person I needed to talk to. I explained why I was there, showed them our rasp jewelry and asked if there was any way we could be a vendor during the NFR/WSTRC. They were extremely impressed with our product and had never seen anything like it, and within a matter of 5 minutes, they invited us to be a vendor. One would think after this whole ordeal I would’ve been ecstatic right? I left South Point feeling even more crazy and confused…did that really just happen? What in the heck is going on and what are Bryan and I getting into?! I called Bryan and told him the good news, but he could sense I was in a state of shock. He told me, “We’re going to do this and it’s going to be an amazing experience. We’ll figure it out together.” I was at a loss of words, which is extremely rare if you know me. He then told me, “Honey, God is showering us with Favor right now! He is rewarding you and us for listening to his word. Remember, God’s voice told you to “Drive to Vegas." At that moment, I knew I had to completely trust in God’s plan and let go of what I thought the plan for my life would be. I knew my life would be different from here on out because I was turning it over to God. Within a matter of six short months, I completely let go and completely let God guide us with the venture of taking our hobby and turning it into a business. We produced over 350 pieces for our first year as a vendor at South Point in 2015. We were faced with countless obstacles during that time period and overcame each and every one. We also found out were expecting our third child during this time. I was either on the couch, in bed, or in and out of the hospital for the first five months of the pregnancy due to severe morning sickness and dehydration. 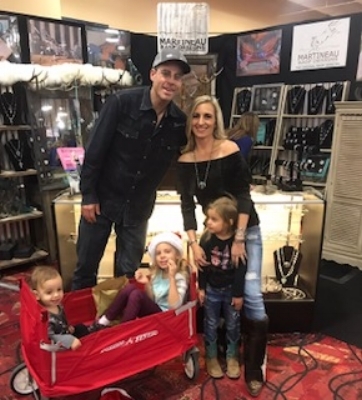 I was basically non functional, trying to take care of two toddlers, create a business from the ground up, figure out how to design and create our booth set up for South Point, and help my husband make the jewelry when I wasn’t sick. One month before the show, we were considering pulling out of the show because I couldn’t move or keep any food down. How was this going to work if I couldn’t even function? Then, slowly, week-by-week, I got better and stronger, and finally felt up to par the week we left for Vegas. The first year as vendors in Vegas 2015. Melanie was 5 months pregnant with their third child. She got sick twice during this show! Our first time being a vendor anywhere and at NFR/WSTRC was a huge success. We knocked the goals we set out of the park! The feedback from everyone who visited our booth was beyond amazing. We never would have imagined, never ever thought of doing any of this without God and his guidance to us just six months before. We didn’t have any plans to form a business out of our hobby and yet God had this wonderful plan for us! He spoke the words to me “Drive to Vegas” and I confided in my husband. We chose to be obedient in God’s word and trust in his plan. It was such a hard thing for me to do with handing the reins of my future over to God. Bryan and I would not be where we are today if we wouldn’t have been receptive to hearing God. None of this would have happened if I would’ve continued to ignore God’s voice. None of the endless amounts of favor and blessings would occur had we not been obedient to God’s word. I simply wouldn’t be here, in this position of sharing all this with you today. My greatest wish and prayer for anyone in any circumstance of life, good or bad, is to have the experience of physically hearing God’s voice and being open to it. It can truly set one’s life free as it has mine. The longevity of experiencing God’s love through hearing his voice, just once, is life changing. Through this experience I’ve learned it’s more than okay to let go and not try to plan every single thing out in life. It’s more than okay for everything in my life and around me to not be perfect. I’m no longer scared to trust in my Creator with his plan for my life. Even with all the hardships that can occur in life, God has a greater plan for you, me, and everyone. God’s vision for our lives is far more clear and advanced than we could ever try to understand or see.